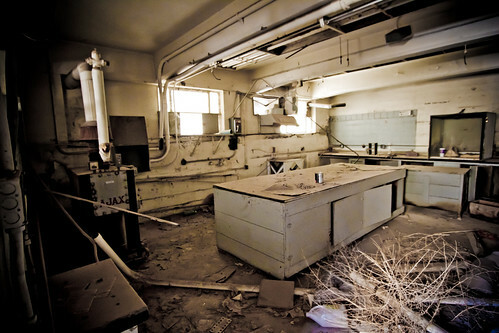 I finally had the opportunity to venture into the old main office building at the Southwestern Portland Cement Plant. I didn’t want to wander around in there alone so I asked a friend of mine to go with me. His only request was that we not get arrested. Given all of the other possible dangers when exploring abandoned buildings, I’m glad he was only concerned about the police. Time to head in! In the map above the office building is outlined in orange. The stairs to the second story front entrance can be seen from Piasano drive but there is no access there, it’s welded up tight. The easiest entry point is from a lower entrance at ground level. You have to walk around to the side, looking for a set of stairs that go below grade. In the picture below the stairs are right behind the bush. The stairs to the right, lead up to a door that is locked. The lower door that has been pried away, exposing a large room that has a bunch of cabnets and work surfaces. It looks like some sort of testing area where they may have preformed quality control on their products. To the right is another room that has a narrow set of stairs that lead up to a mid level. That is the darkest, most claustrophobic part but once you get to the top, light from the second story windows fill the area. 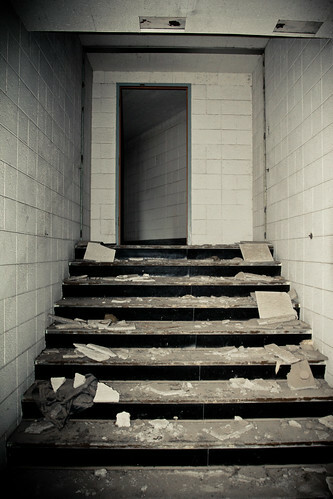 This odd area was in the middle of the building with a second set of wider stairs leading up to the office level. The building has kind of a weird feel about it. 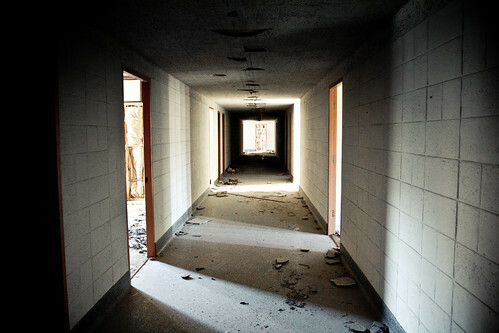 A long narrow hallway runs its length. Offices hang off to each side letting light in but the low ceiling and cinder block walls negate any openness the light provides. the place is gutted with little reminiscent of previous office activity. 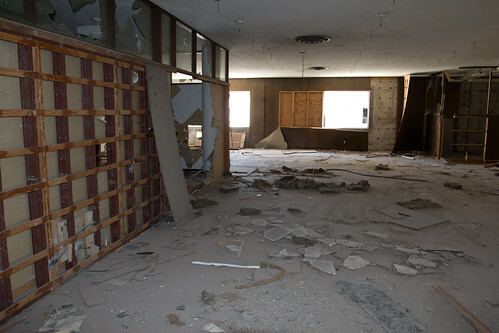 The offices had wood paneling which has been removed in large sections and in any area where copper pipes may have been, holes have been punched in the walls to remove it. 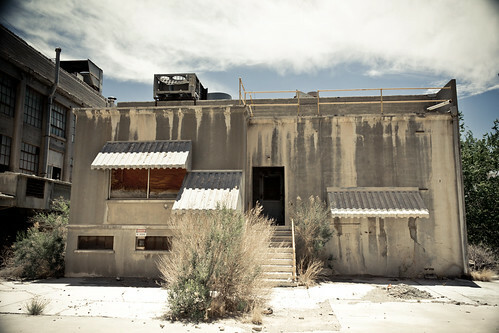 The long hall ends in a large open office area and judging by the largish corner offices, this was the executive area. 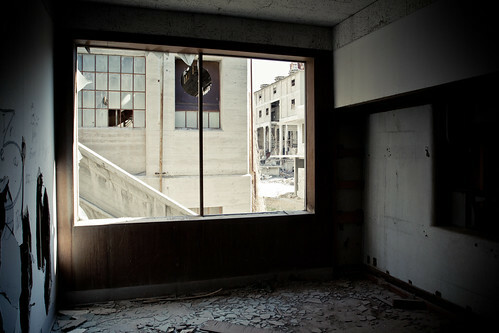 The windows have been broken out everywhere exposing the interior to the elements. It’s also obvious that vagrants have been here making sleeping areas from insulation ripped out of the walls. 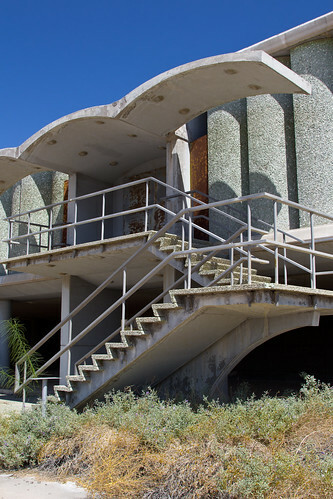 I though that these offices might have fared better than the rest of the plant but the passage of time and vandalism have really done a number on the place. These little curiosity’s are the best finds when exploring abandoned places. 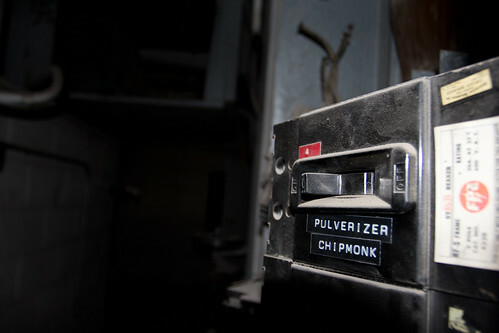 Pulverizer Chipmonk? Who knows what that was but it sounds like a great band name. Once out, we walked around a bit more but time soon found us. We both had 1:00 meetings that we needed to get to so we hit the road.